The fun way for kids to learn a new language, KidSpeak is a language-learning breakthrough that makes learning easy for kids ages 5 to 13. Each language is hosted by a fun cartoon "friend and pet", who speaks that language to your child. KidSpeak is available in eleven different languages. 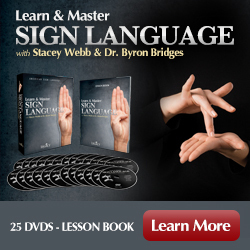 Learn & Master Sign Language is a comprehensive video instruction course for learning American sign language. In each lesson, students will learn vocabulary, practice signing and reception skills with sentences, questions, dialogues, and narratives. There are over 2000 vocabulary words. Students will also learn about expansion features in ASL, finger spelling, numbers, and facts about Deaf culture. Includes free online support. Rosetta Stone Homeschool is a self-paced foreign language curriculum specially designed to provide homeschool students with a rich, fully interactive and engaging language-learning experience, while giving parents the tools and resources needed to manage student progress without extensive planning or supervision. There are 25 different languages from which to choose.